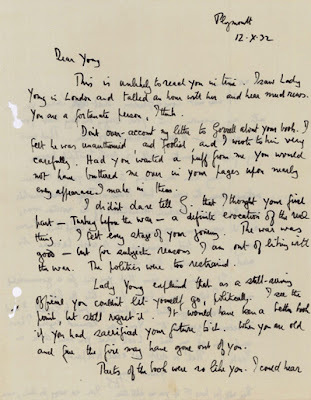 Hold on to your keffiyeh: the asking price for a letter written by T.E. Lawrence aka Lawrence of Arabia that has recently come into the marketplace is $47,514 (€35,000). For Lawrence collectors it's an acquisition dream, for historians a must read. For Lawrence of Arabia fans, it's Peter O'Toole's mythical hero three years before he got on his motorcycle for the last time. Sent from Plymouth on October 12, 1932, Lawrence wrote to Maj. Sir Hubert Young (1885-1950), who was attached to Prince Faisal I beginning in early 1918 as a British assistant political officer during the Arab Revolt against the Ottoman Empire. Later in 1918 he was awarded the DSO for gallantry in Mezerib, Syria. After the war, he joined the Foreign Office in London and at the time of this letter was First Minister of Baghdad. "I didn't dare tell G[orrell] that I thought your first part - - Turkey before the war - - a definitive evocation of the real thing. I felt every stage of your journey. The war was good - - but for subjective reasons I am out of liking the war. The politics were too restrained. "Lady Young explained that as a still-serving official you couldn't let yourself go, politically. I see the point, but still regret it. It would have been a better book if you had sacrificed your future to it. When you are old and free the fire may have gone out of you. "Parts of the book were so like you. I could hear and see you. "It was not Constantinople [?] that burnt you into my memory, but your saying one day that you were afraid - - of some incident or other. That was my first encounter with a really thruthful person. "I may have been wrong to suggest you for Bedouin actions during the war: but Nasir's Jurf-Hesa demolition was the biggest Bedouin demolition of the northern war, and it was your organizing. No, I don't think I was wrong. You took transport & H[?] work because its need was greater, that's all. "It is very good news that you are for a governorship next [Nyassaland, i.e. Malawi]. I hope you & Lady Young like the life. "Don't imagine that in refusing the puff to Gorrell I did it because I grudged it. You can command anything I have and am at any time. Look what you have done in Irak! That's a debt not easily to be paid." Regarding the Nasir demolition that Lawrence refers to, Richard Aldington, in Lawrence of Arabia. A Biographical Enquiry (London, 1955), wrote: "Just before the New Year, 1918, Sharif Nasir attacked and captured the station of Jurf (between Maan and Hesa) with 200 prisoners. This result had been accomplished by Beni Sakr Bedouins and one mountain gun" (p. 216). Lawrence signs the letter "T.E.S." - Thomas Edward Shaw - his post-war pseudonym. Being Lawrence of Arabia had become an onerous burden to him and he simply wanted to be swallowed up into obscurity. 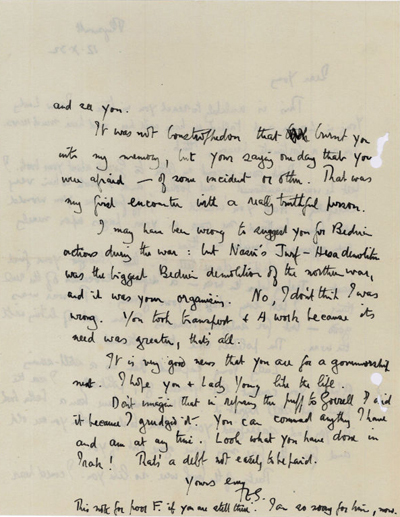 It is no secret that he was bitterly disappointed and frustrated by how events in the Middle East had evolved during and after the war, as hinted at in the letter: "The politics [of your book] were too restrained." The British and French were by no means restrained in their power grab in the region, carving it up under the secret Sykes-Picot Agreement of 1916 and in the immediate aftermath of the War establishing the boundaries for the Middle Eastern nations we now know under a mandate system sanctioned by the new League of Nations. Lawrence of Arabia would have ruefully nodded his head. LAWRENCE, T[homas] E[dward], British explorer, intelligence officer, and writer (1888-1935). Autograph letter signed ("T. E. S."). Plymouth, 12. X. 1932. Small 4to. 2 pp. Images courtesy of Inlibris, currently offering this item, with our thanks.